There’s a time warp along the stretch of Highway 101 that runs between San Jose and Marin County in Northern California. To many there, it looks like 1999 all over again. While the rest of the country is landscaped with foreclosed homes and empty big-box stores, San Francisco and Silicon Valley have a shortage of office space. Established tech companies like Google are offering seven-figure bonuses to retain talented engineers, while the Sand Hill Road offices of venture capitalists are full of optimistic twentysomethings looking for funding—and many of them are getting more than they need. In the most infamous example, a startup called Color received $41 million before it even released its first product, a cryptic photo-sharing app for the iPhone that puzzled reviewers and users alike. The company has since “pivoted” (that’s startup talk for taking a mulligan). The New York Times, for its part, has published scores of articles suggesting that another tech bubble is imminent. So is it time to brace ourselves for the worst? The answer is no (or, at least, not yet), and that’s because there are some major differences between the dot-com bubble of the late 1990s and what’s happening now. To begin, the profiles of the people playing the game are different. A lot of the huge valuations the press is writing about—Twitter approaching $10 billion, Facebook at $75 billion—are of private companies with small numbers of shares being traded on so-called secondary markets. These markets are meant to let employees sell their options in one-off trades to big investors, and are legally limited to stocks with fewer than 500 shareholders. If they go beyond that size, companies have one year to file with the SEC and allow their shares to be traded publicly. In other words, this boom is being fueled by rich and well-connected investors, not middle-class retirees betting their life savings. There are exceptions, of course, where some wealthy individuals are being encouraged to buy shares in hot private companies via “tertiary trades.” This is a growing concern, as the secondary markets aren’t regulated as strictly as public markets and these investors may not be getting all the information they should. But it’s still far harder to buy one of these stocks than it was to buy a publicly listed dot-com, and that limits the potential fallout. Second, the companies receiving the most buzz have sounder fundamentals. The most commonly accepted way to value a company is to estimate its future cash flow, then discount it back to the present day based on expected inflation rates. That necessarily involves a lot of guesswork. But today's hot tech companies—Facebook, Twitter, Groupon, Zynga, and LinkedIn, to name a few—at least give investors some good reasons to make optimistic guesses. All of them have tens of millions of customers, positive cash flow, and fast growth. In contrast, the end of the dot-com bubble was characterized by bets on companies that had no fundamentals at all—no profit, no revenue, no customers, no cash flow. Just projections. Third, the rest of the tech market isn’t behaving like a bubble at all. In the 1990s, the dot-com boom lifted nearly all tech stocks to crazy heights. That’s just not true today. Established tech companies with billions in revenues and profits are priced as if investors expect almost no future growth. Google has a price-to-earnings ratio of 19. Apple is at 16. And Microsoft—which earned $22 billion on $68 billion in sales in the last 12 months, giving it the kind of profit margins enjoyed by almost no other legal business—is at about 10. As Netscape founder turned venture capitalist Marc Andreessen recently quipped, these are the P/E ratios of steel mills that are going out of business. Finally, the sheer opportunity presented by these new markets appears to be much bigger. By the end of the 1990s, there were about 360 million people on the Internet. Most of them were in the United States and other developed countries. While growing fast, the Internet was still unknown to most of the world. Today, there are more than 2 billion people online, and a lot of growth is coming from Internet-connected mobile phones in developing countries. The promise of 15 years ago—that “the Internet changes everything”—is actually kind of true now. Of course, this doesn’t mean you should run out and buy stock in these hot tech companies as soon as they go public, unless you have money to spare and a high appetite for risk. 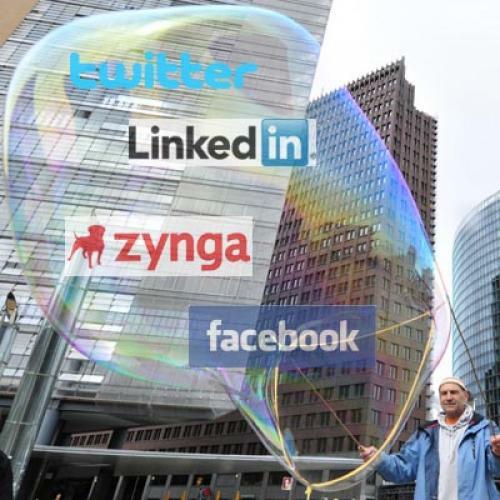 But today’s highly valued tech startups are fundamentally different from those that burst the last bubble. And until you see a company with no customers and no cash flow going public on nothing more than a slide deck and a bunch of buzzwords—and people actually buying it—you can rest assured that the next bubble is not (yet) upon us. Matt Rosoff is the West Coast Editor for Business Insider SAI and a veteran of the first dot-com boom.